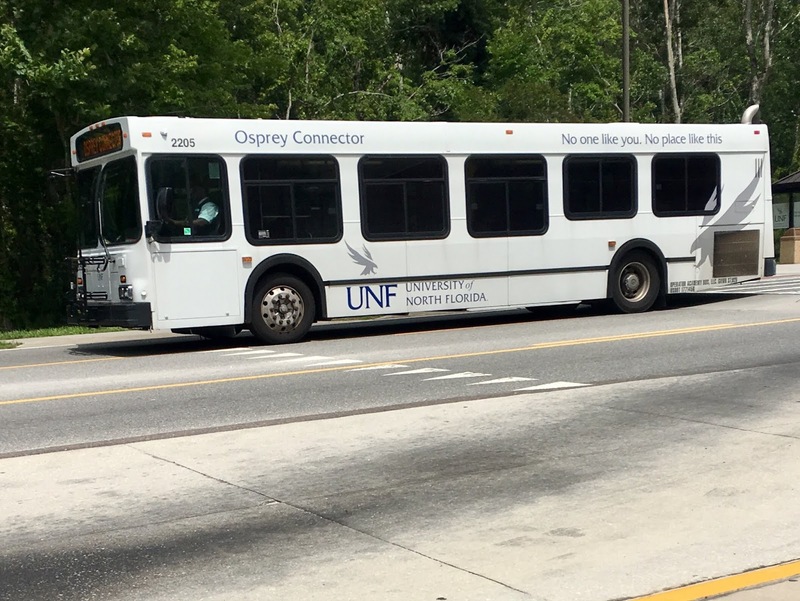 At the beginning of this academic year in August 2018, UNF changed providers for their shuttle service, the Osprey Connector. Previously, the shuttles were operated by Academy Coach and used a fleet of 2002 New Flyer D35LF and 2003 New Flyer D30LFs. 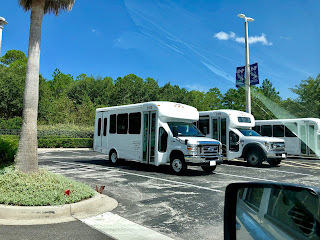 But, they either did not opt in for another contract or a deal could not be made and UNF changed providers - they chose Echo Tours & Transportation (dba Echo Transportation). 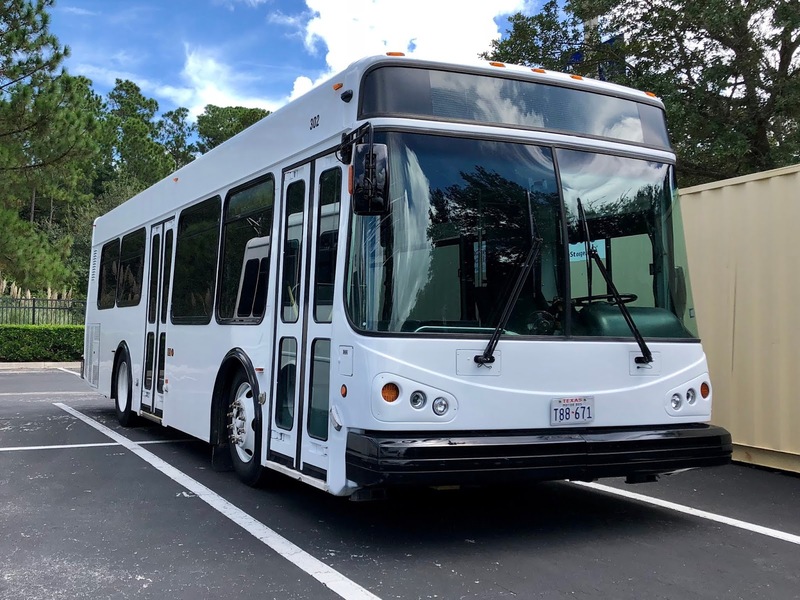 Since Echo Transportation did not operate in Jacksonville prior to taking this contract, they had to purchase new buses for the service. 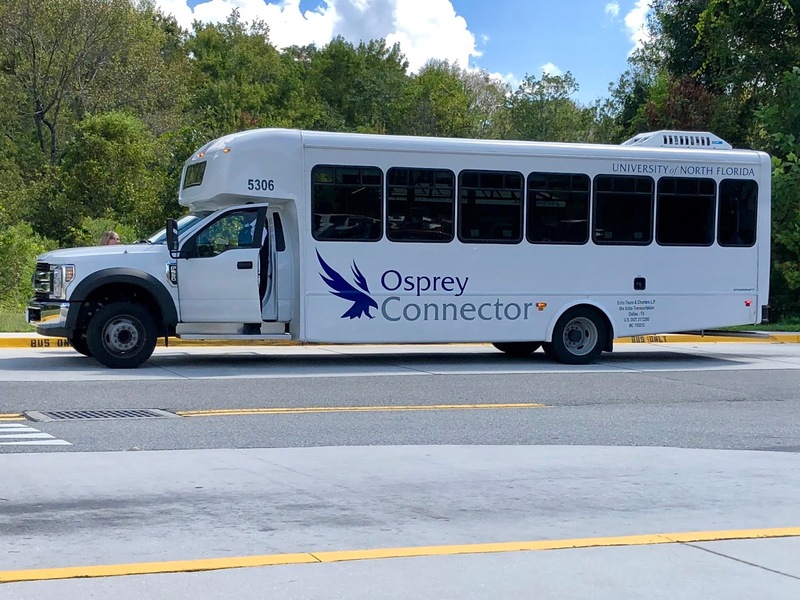 Many of the drivers were given the opportunity to change companies and continue running the Osprey Connector and keep their seniority. 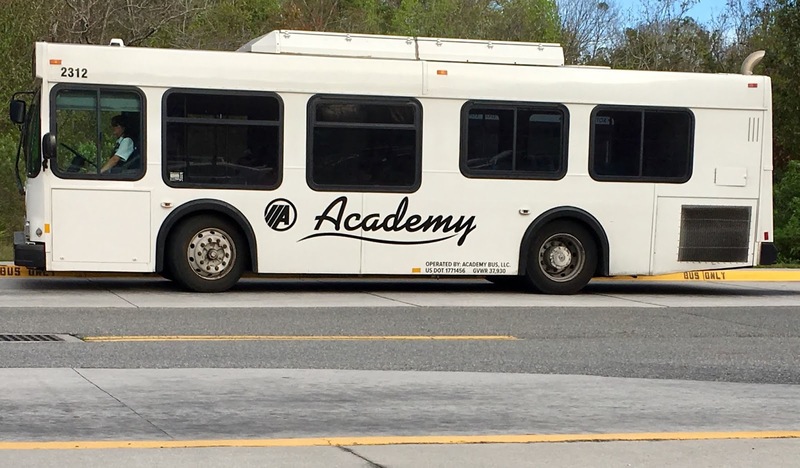 Drivers who did not want to leave Academy stayed, and some new drivers were hired too. Below I outline the types of buses used, both before and after the switch from Academy to Echo Transportation, as well as an issue with what buses are assigned to what routes here on campus. The latter part I tried to write so it makes sense and is coherent, but is opinionated on how it should be ran. As I said above, the old fleet was a fleet of New Flyers, while these buses were older (and certainly not my favorite transit bus), they were much better for this service since they could hold many people. Academy had 12 buses assigned to UNF, 2201-2210 were 2002 New Flyer D35LFs and had a UNF Osprey Connector livery. 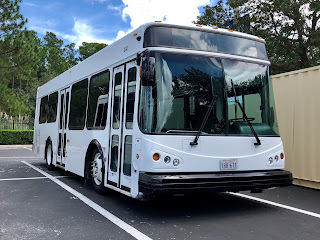 Buses 2311 and 2312 were the 2003 New Flyer D30LFs and had general Academy Coach branding (these were also used on other shuttle routes that Academy operated, while the 2200s were solely operated at UNF). The new buses, operated by Echo Transportation are a fleet of mostly Ford cutaway buses, with a few El Dorado buses. While these buses are new, the New Flyers that Academy ran where much better because during the morning and evening hours, the buses tend to fill up with students going to or from the outer parking lots. I had seen in several instances where a 35' bus is completely full. Now, short cutaway buses are used and still can be standing room only at some times. Also, it's worth noting, the seats are in pairs all facing forward, which makes moving throughout the bus (or standing if you have to) a pain. Currently, I don't have any interior shots. Now, I think Echo Transportation has a contract to run shuttles someplace else in Jacksonville because of the numbering system they used. The currently operated buses are a fleet of Ford cutaway buses and a few ElDorados. They all feature destination signs, bike racks*, wifi, and automated stop announcements. This is from when the buses first arrived and didn't have any decals. 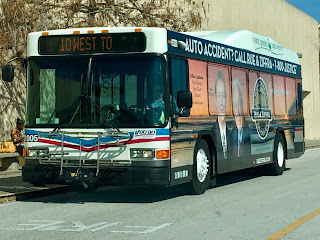 This bus has since received the same decals as the 5300s, as well as a destination sign. 5100 is usually used either for campus tours, or for the paratransit service (see below for information). Bus 5306 with the decals. Note, this was before the bike racks were installed. The 5300s are typically used on the Campus Route or the Town Center Shuttle. Here's why I'm thinking Echo Transportation runs shuttles someplace else in Jacksonville because of the random numbering of these two buses. This is 302 when it first arrived, it has since received the add-ons noted above. The 300s are typically used for the Campus Tours, or not at all (see the next paragraph for more information). The Osprey Connector consists of two routes, the Campus Route, the Town Center Shuttle, as well as two special routes: the Paratransit service, and Campus Tours. The Campus Route runs from Lot 53 and The Flats Apartments at the south end of the campus into the main campus area and out the north end to Lot 18. This is the main route operating Mon-Fri 7am-3:30am, and Sundays 6pm-3:30am. The Town Center Shuttle runs from the UNF Library to the Town Center Shopping Mall just off campus, Mon-Fri 10am-4pm, Fri-Sun 11am-3pm. 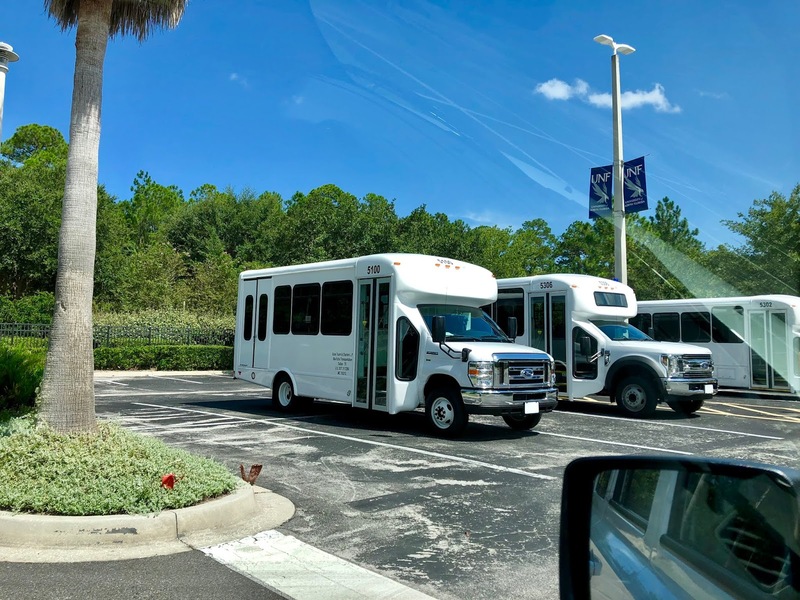 The Paratransit service runs from the closest pickup point to the closest drop off point for disabled students and faculty (both permanently and temporarily disabled). The Campus Tours run from the Visitor's Center to one of the dorm buildings where the tour then walks the campus. The bus then picks the tour back up on the other end, near the Wellness Center where the tour then rides the bus back to the Visitor's Center. Here's my issue with how the buses are assigned. The Campus Route is the one I was talking about earlier when I said the buses can fill up and be standing room only, the logical thing would be to assign both 300s as some 5300s to that route. Well Echo Transportation only assigns 5300s. Having both 300s would eliminate crush loads on a few buses, creating a better ride experience for both drivers and passengers. Sometimes (and I sometimes think they're mocking me), they'll put a 300 in after 7pm and run it until 3:30 am when the shuttles pretty much run empty anyways, but won't put them out during the daytime when they're needed the most. The Town Center Shuttle only has a little over 100 riders per week, it usually has a 5300 assigned which is fine, but occasionally it'll have a 300 assigned. Every time I see a bus on that route, it is usually empty or almost empty. A full on transit bus (such as the 300s) definitely is not needed here. Occasionally I'll see a 300 running on the campus tour, which is fine because some tour groups are larger. So basically, long story short, what I'd like to see is at least one of the 300s used daily on the Campus Route to ease the load issue, ideally all the buses would be transit buses but the company bought cutaways. First a little background about myself, I have always been interested in public transportation since I was a little kid. Now that I'm older and have better views of the world, I've realized I can turn a hobby into something potentially more. So, as I said above, I am studying Transportation & Logistics so that I can work in the public transportation industry and hopefully make better transit options for people. 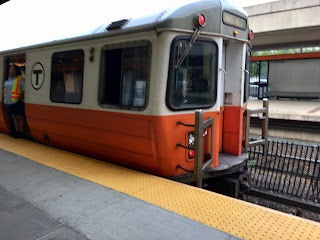 In this second introduction post, here is a list of transit services I have ridden on in the past. The list below is broken down by agency, then by route. You'll see the Route #, followed by the name (if applicable), and then the endpoints (This does not mean I have ridden the entire route, however). Congratulations to the New England Patriots on their 6th Super Bowl Championship! Their championship parade will be Tuesday, Feb. 5 in Boston. The parade starts at 11am from Hynes Convention Center and travels along Boylston and Tremont Streets to City Hall. The MBTA will be providing rush-hour service all day to accommodate the crowds as well as providing additional cars on some Commuter Rail trains. Getting to the Parade and Service Changes SubwayTrains will run every 5-6 minutes between 6am-7pm.